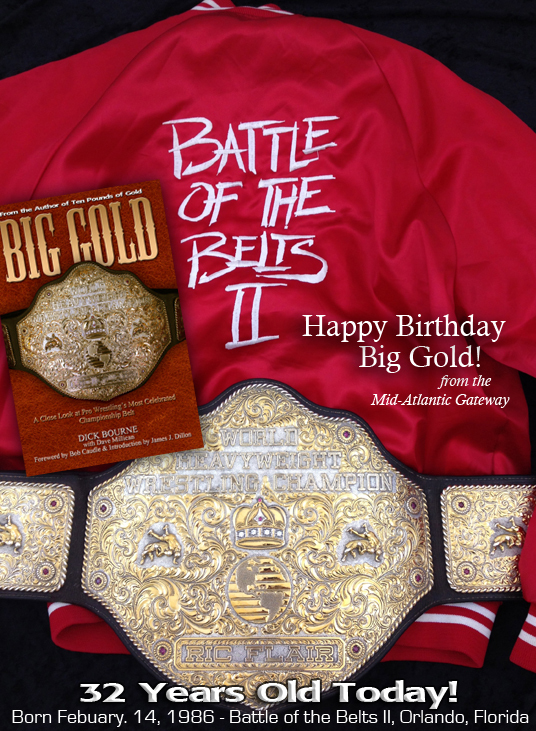 Mid-Atlantic Gateway: Happy Birthday, Big Gold! The iconic belt made its national (and worldwide) debut at Championship Wrestling from Florida's "Battle of the Belts II" satellite broadcast from Orlando on Valentine's Day night, February 14, 1986. The gorgeous new belt (complete with the champ's name infamously mis-spelled "Rick" Flair) replaced the iconic "Ten Pounds of Gold" belt that had been worn and defended by NWA champs since 1973. The main event that night in Orlando was Ric Flair vs. Barry Windham. Windham had just returned to Florida and the NWA from a stint in the WWF. The photo above features the actual Crumrine belt (not a replica) nestled into a vintage "Battle of the Belts II" satin jacket that originally belonged to Barry's father Blackjack Mulligan, and was worn that night. Action Figures Friday: 1978 Tag Team War!